UNITED NATIONS, Jul 27 2016 - Industrialisation in Africa is being driven by African leaders who realise that industries as diverse as horticulture and leather production can help add value to the primary resources they currently export. The African Union ‘Agenda 2063: The Africa We Want’ sets out a plan to transform the economy of the 54 countries in Africa based on manufacturing, said Li. 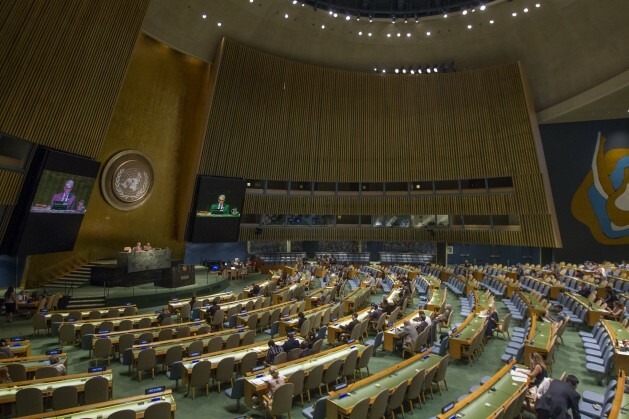 The process received support from the UN General Assembly on Monday with a new resolution titled the Third Industrial Development Decade for Africa (2016-2025). The resolution was sponsored by the Group of 77 (G77) developing countries and China in collaboration with the African Union, said Li. “These steps create a momentum that all “industrialization stakeholders” in Africa must take advantage of,” said Li. The resolution called on UNIDO to work together with the African Union Commission, the New Partnership for Africa’s Development (NEPAD), and the Economic Commission for Africa to work towards sustainable industrialisation in Africa over the next 10 years. The types of industrialisation African countries are embracing often involves adding value to the primary commodities, from mining or agriculture, that they are already producing. It includes horticultural industry, notably in Kenya, Ethiopia and Senegal, beneficiation, adding value to minerals mined in Botswana, and shoe and garment manufacturing in Ethiopia, said Li. This can include building the necessary business infrastructure required for new industries in industrial parks. “We have already seen some countries move ahead with attracting investments into industrial parks (including) Ghana, Kenya, Nigeria and South Africa,” said Li. Li pointed to recent examples from Ethiopia and Senegal, where the respective governments have invested millions of dollars in building industrial parks to attract foreign investors that create jobs and exports for these two Least Developed Countries (LDCs). Currently, there are 48 LDCs around the world, of which 34 are in Africa. Most LDCs rely on a handful of primary resources for exports, such as gold or the so-called black golds: oil, coal and coffee. The decent work and value addition that come with industrialisation are considered a key way that these LDCs can grow, transform and diversify their economies and become middle income countries. Most LDCs rely on a handful of primary resources for exports, such as gold or the so-called black golds: oil, coal and coffee. LDCs in Africa have had “very low and declining shares of manufacturing value added in GDP since the 1970s”, noted Li. By investing in industry, these countries can add value to their primary exports, including through agro-industry, as is the case in Ethiopia, whose main exports include coffee, gold, leather products and live animals. “Manufacturing connects agriculture to light industry” noted Li, such as through food processing, garments and textiles, wood and leather processing. Moreover, industrialisation does not necessarily have to be incompatible with the shift to a low carbon economy, said Li, since use of resource and energy efficient production methods and renewable energy in productive activities such as agro-industry, beneficiation, and in manufacturing, in general, will lead the economy onto a low carbon path. The world’s least developed countries are following in the footsteps of other countries which have already achieved development, in part due to the industrialisation of their economies. LDCs are “really eager to learn from those countries (that have) already gone through this process so that is why we have established South-South cooperation,” said Li. However industrialisation does not only benefit the developing countries which want to attract it. “Firms in today’s manufacturing powerhouses such as China, India and Brazil that are faced with rising wages at home are searching for locations that offer competitive wages, and appropriate infrastructure,” said Li. With populations in many countries around the world beginning to age, Africa also has a comparative advantage to offer with growing young populations in many African countries. “With its young and growing population, some indications show that Africa has the potential to become the next region to benefit from industrialization, particularly in labor-intensive manufacturing sectors,” said Li. By providing employment and opportunities for these young people at home, industrialisation can also address other issues, including migration, inequalities and climate change, noted Li. “Industry means creating jobs and incomes and industrial jobs partially reduce the pressure on migration and also resolve the root causes,” he said. Li noted that UNIDO works closely with all developing countries, often through the Group of 77 and China, which represents 134 developing countries at the UN. “The G77 and China has diverse membership, including Least Developed Countries, Land Locked Developing Countries, Small Islands Developing States, and Middle Income Countries, located in almost all regions of the world and with diverse range of priorities with respect to industrial development,” he said. This can include collaborations with “science, technology and research and development institutions, targeted foreign investment promotion, and other relevant services,” said Li.